Are you a photographer looking for a chance to exhibit and sell your work this holiday season? The Florida Museum of Photographic Arts is now accepting submissions to its annual Photography Benefit Sale. The benefit sale gives FMoPA members the chance to display and sell their work within a museum setting, and it gives museum visitors a rare opportunity to view—with the option of purchasing—work produced by local photographers. 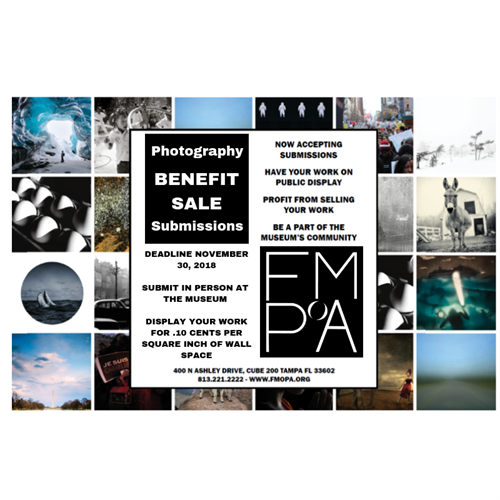 “Every year we look forward to the Photography Benefit Sale because we are able to host many different photographers in one space and build the community we have at FMoPA,” said FMoPA Executive Director Zora Carrier, Ph.D.
To participate in the benefit sale, photographers must become or already be a member of FMoPA. Members can submit their work now through Nov. 30. There is no limit to the number of pieces each member can submit. There is a small manipulation fee of 10 cents per square inch of the wall space occupied by each piece (example: an 8-by-10-inch framed photograph will cost $8). The exhibition will be on display December through January. Artists set their own prices and keep 100 percent of the proceeds from the sale. Visit www.fmopa.org/benefit-sale to register. To become a member and participate in the benefit sale, visit www.fmopa.org/join. For more information, please email info@fmopa.org or call the museum at (813) 221-2222.